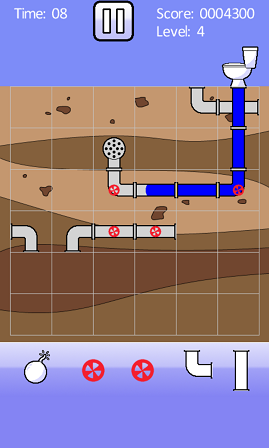 One of best puzzle games for kids to be specific my favorite connect water pipes game is Flush from Treckle games. 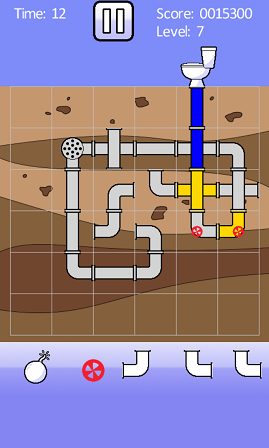 On my Windows Phone 8 smartphone, Nokia Lumia 920 I have download and installed this pipes game for kids and enabled in Kid's Corner. But I also find it as a very addictive puzzle game. Especially this water pipe game becomes more interesting and fun with increasing number of levels. The story behind Flush water pipe game is that. You are a plumber and on one of the buildings the toilets are installed before the pipe network is fully installed. So you must be hurry to connect the pipes to the drains before any one use the toilets. There is time limitation on each game. So after sometime the plumber is expected to install all water pipes and additional required segments before the toilet is used. After you hear the noise of flowing water, you have still some time till it flows out of the water pipes. If you have not finished to connect pipes game becomes more fun at those last seconds. It is obvious that the plumber will earn more points by using longer water pipe lines. Also if undestroyable static yellow pipes are used, these will gain the gamer additional points. If you destroy a water pipe using bombs, your points will decrease per each bomb. Valves are used to pump the water up in the pipes. Otherwise, although you connect the toilet to its drain you will fail in solving this puzzle game level. Multiples toilets make the game more interesting and challange for this puzzle water pipes game. Total download size is 4 MB and only in English. But the language is not a problem since this marvellous pipes game is easy to understand and controls are user friendly. What I can suggest for this pipes game for kids is using more interesting and colorful graphics.